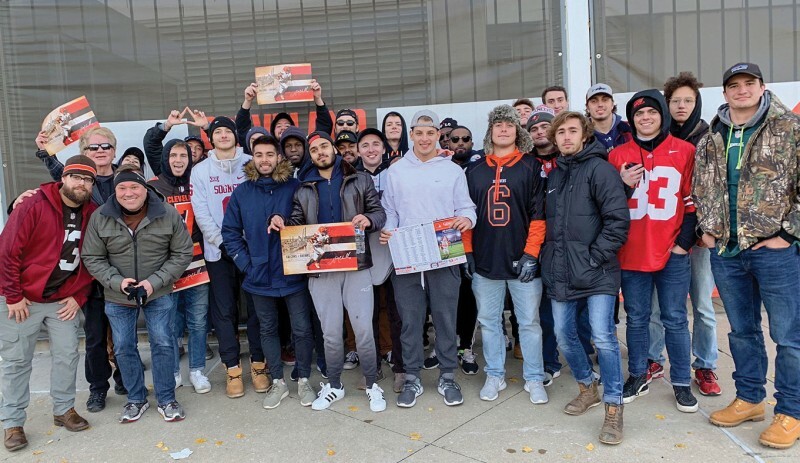 Rusty McClure ’72 treated 40 Delta Tau Delta brothers to a trip to Cleveland on Nov. 11 for the Cleveland Browns game against the Atlanta Falcons. For the excursion, which began at the Delt house at 10:30 a.m., McClure chartered a large luxury bus and bought a section of tickets at the game, which the Browns won, 28-16. It was the first NFL game for at least a dozen of the students, who were also accompanied by Delt chef Billy Thompson. 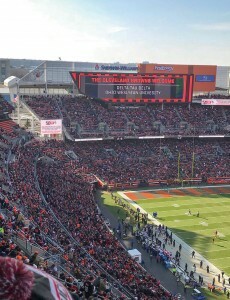 Before the trip, McClure arranged with the team’s marketing department for a special welcome for the brothers to be displayed in FirstEnergy Stadium. “Our guys thought this NFL scoreboard recognition was very, very cool,” McClure reported. “On our return, we pulled off I-71 onto Rt. 36 to Delaware and stopped at the White Castle, picking up bags of sliders and fries — one bag for each guy, six cheese sliders and fries — I had pre-ordered on my phone as we left Cleveland,” McClure said. They were back on campus by 7:30 p.m. Sunday night, in time for a good night’s sleep before class the next day. McClure (second from left with sunglasses on) with his Delt brothers.